Animal Antics is the fifth level of the Lost World in Donkey Kong Country 2: Diddy's Kong Quest. It is also the final non-boss level in the game. It is only accessible from the Klubba's Kiosk in K. Rool's Keep, but in the Game Boy Advance remake it is accessible from any of his establishments. 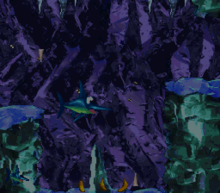 Completing this level and the previous stages of the Lost World unlocks the final battle at Krocodile Kore. This level is split up into five parts, one for each of the five playable Animal Friends. Animal Antics has a variety of archetypes, including jungles, ice caverns and bramble areas. Diddy and Dixie transform into each Animal Friend from an Animal Barrel, played in the order of Rambi, Enguarde, Squitter, Squawks, and lastly Rattly. Each of their special abilities are required in these trials. Enguarde swims through his section of the level. The Kongs immediately start the level inside an Animal Barrel that turns them into Rambi. The rhinoceros can find a DK Barrel behind the start, as well as several Neeks ahead of it, who crawl along large, stair-like platforms. Soon, the animal encounters a red Zinger, who he must jump on in order to cross a section of spikes and reach a small area of ground with some Kaboings on it. There are more spikes ahead of here, and a pair of tall pillars stand above them, with one Zinger on each. The pillars are followed by two more red Zingers, who must be bounced on to cross the remaining spikes. A doorway is located after here, and it leads into an icy cave that begins with a DK Barrel and a small hill leading down to a trio of alcoves. The letter K is above the alcoves, and as the rhino tries to collect it, he must also watch out for a kannonball-shooting Kannon. After sliding down another icy slope, the Animal Friend lands in an Animal Barrel suspended over the water. The barrel turns him into Enguarde, who must begin traveling by entering a wide area full of Shuries, Flotsams, and a few Lockjaws. To the left of this area, there is a hidden room that contains the letter O and several bananas that group together to form the shape of the Rare logo. If the swordfish continues to the east, he passes a large group of Shuries, and then an even larger group of Puftups, many of which explode when approached. Shortly after the animal travels upwards past a few Lockjaws and an alcove containing a Banana Bunch, the water level begins to lower. The exit of the cave area is nearby, and it leads the swordfish into a jungle area inside of an Animal Barrel, which quickly transforms him into Squitter the Spider. Behind the spider at the beginning of the area, there is a hidden Banana Bunch. A Zinger guarding a DK Barrel is ahead, being followed by a Star Barrel (exclusively in the original version of the game), several Kaboings, and a long area of spikes with a few pillars in it. Each pillar holds a bouncing Kaboing and is circled by a red Zinger. Squitter's web platforms are required to pass this section, and once he does so, he encounters several more Kaboings. Another long area of spikes is not far from here, and this time, there are no pillars of land between the spikes. Therefore, the spider must continue by using his web platforms. On the way across, he meets several Zingers and also approaches a Banana Coin located in a small space among the spikes. Once the spider crosses the area, he discovers an Auto Fire Barrel that shoots him to a bramble area. A Bonus Barrel is hidden on the other side of the wall next to the Auto Fire Barrel. Rattly bounces on some red Zingers to cross over the spikes. After the Auto Fire Barrel shoots the spider into the bramble area, he can find a DK Barrel, and also the Star Barrel in the Game Boy Advance remake. Several sharp brambles surround Squitter's path ahead of here, and the animal must use his webs to climb through them. As he travels, several Mini-Neckies swoop down at him and attack. Once he passes these foes, he reaches some wooden boards that hold an Animal Barrel that he must enter to turn into Squawks. Squawks must begin his journey through the area by heading through more brambles as the wind pushes him from left to right. After the parrot passes a Zinger in a wide section, he enters a narrower pathway that contains some red Zingers that float in and out of alcoves. He can find the letter N in an alcove being guarded by a trio of Zingers ahead of here. Another group of Zingers block the way into an additional alcove that, in the Game Boy Advance version of the game, contains a photograph. If the parrot heads east from here, he meets a large group of Flitters and then a DK Barrel in a corner. The wide path below here leads the hero past several red Zingers, one of which that moves back and forth in a horizontal path. If he progresses to the west at the bottom of the area, he finds small groups of Zingers that block his path, as well as a few Banana Coins that float in the corners of the area. Once Squawks flies past a few Zingers that fly in small circles in the narrow pathway, he reaches an Animal Barrel that turns him into Rattly. The rattlesnake must start his portion of the level by first jumping into an Auto Fire Barrel in a narrow passage. A blue Extra Life Balloon is hidden above the gap. 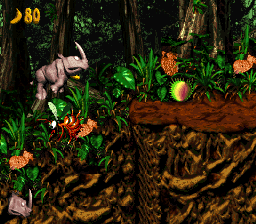 The Auto Fire Barrel blasts the Animal Friend into another jungle area that is full of spikes. In the Game Boy Advance version of the game only, Rattly can travel to the west of the entrance to this area to find a short path leading over some spikes and red Zingers. On the way across this part of the area, the rattlesnake can find a DK Barrel and a Klampon that is followed by an alcove that contains three Banana Coins and a Golden Feather. If Rattly travels east from the entrance to this jungle area, he makes his way onto a high piece of land with a Klampon on it. 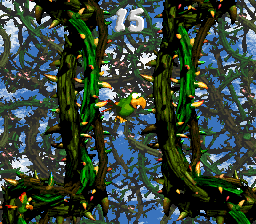 A long area of spikes is ahead of it, but Rattly can safely cross it by bouncing on the red Zingers that fly over the spikes. Some of the Zingers move, while others are stationary. 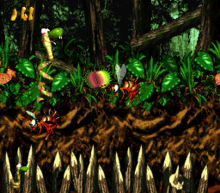 After crossing the spikes, Rattly reaches a No Animal Sign that turns him into the Kongs and also makes a Banana Coin appear. The heroes must continue through the level by heading into a nearby Auto Fire Barrel, which then shoots them past a pair of red Zingers and onto a high piece of land, where an End of Level Target sits. If they hit the target, they complete the level. Additionally, if they hit the target immediately after shooting out of a nearby Barrel Cannon, they can win a prize, either a Banana Bunch, Banana Coin, or a red Life Balloon. Immediately before Squitter exits the second jungle area of the level, he approaches an Auto Fire Barrel that can shoot him into the bramble section. He should climb over the wall to the right of this barrel to reach a hidden Bonus Barrel, which leads to a Bonus Level. Here, the spider has 35 seconds to defeat eight Zingers scattered through a bramble area. Soon, he reaches an Animal Barrel that he must enter to turn into Squawks and defeat the remaining Zingers. If both Animal Friends manage to defeat every Zinger, a DK Coin appears at the top of the area next to an Animal Barrel that turns Squawks back into Squitter. The Animal Friend must collect it before the time runs out and without hitting the brambles. Floating above some alcoves located shortly before the Kannon at the beginning of the icy cavern section. Enguarde should head to the left at the beginning of the underwater area to find a hidden area with an alcove that has the letter O. As Squawks travels through the bramble area, he reaches a trio of Zingers that block a small alcove containing the letter N.
When the heroes reach the End of Level Target, they should super-jump off of the ledge to the left to reach the letter G that floats above some red Zingers. Golden Feather (GBA version) At the beginning of the third jungle section in the level, Rattly should travel west past several spikes and red Zingers to reach an alcove that contains three Banana Coins and a Golden Feather. Photograph (GBA version) Almost immediately after passing the letter N, Squawks encounters a pair of Zingers blocking an alcove that contains a photograph. If they collect the item, they are given a picture of Squawks for the thirteenth page of their scrapbook. Gregg Mayles' original design for Animal Antics (first half). Gregg Mayles' original design for Animal Antics (second half). Rambi rams into a Kaboing. The location of the "O". Squitter in the bramble section of the level. Squawks flies through his segment. The location of the "N". Squitter in the Bonus Area. Squawks flies by two red Zingers. Animal Antics' bramble segment is the only area with brambles to not have the bramble background. In the area with the letter "O", there is a group of bananas in the shape of Rare Ltd.'s logo. This page was last edited on April 6, 2019, at 02:41.